There are some flavors that are just perfect for each other. They dance on your tongue, they light up your tastebuds, they're meant for each other. Strawberry and rhubarb is just such a combination. If they were people, they'd be best friends. There are so many wonderful strawberry rhubarb recipes out there: pie, bars, cheesecake, cookies, bread, muffins, jam, the list goes on. 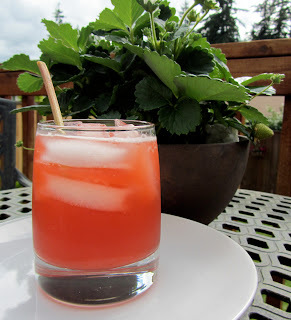 I was pleasantly surprised recently to happen upon a new and different sort of recipe at Closet Cooking: rhubarb soda. Yummy! As good as rhubarb is by itself, I think it's even better with the addition of its old pal strawberry. So, I reunited them. The resulting soda is a unique taste treat. To make the soda, you start by making a syrup. 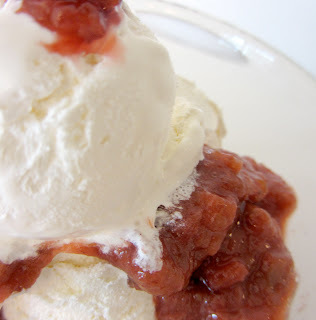 The fruit left over from the syrup makes a wonderful sauce that's just delicious with ice cream, whipped cream, Cool Whip, or just to eat with a spoon! A two for one! This recipe takes a bit of time with the simmering and the cooling, but is very simple, requires very few ingredients, and yields tasty results. 1. Place all of the ingredients into a large saucepan or stock pot. 2. Bring the mixture to a boil. Reduce the heat and simmer for 15 minutes or until the rhubarb is very tender. 3. Strain the liquid into a bowl. Transfer the fruit to a bowl (the color will improve as it cools). Allow the syrup and fruit to come to room temperature. Cover and chill until cold. 4. The fruit is ready to use as a sauce. 5. For the soda: combine equal amounts of syrup and seltzer water in a glass. Add ice (or frozen strawberries) and serve!